The Fed just said it's more optimistic about the job market, but chair Janet Yellen reminded everyone there is a lot of uncertainty about the U.S. economy. The American economy, especially the job market, is getting a bit better, but it's still not good enough. That's the main takeaway from the latest meeting of the Federal Reserve that wrapped up Wednesday afternoon. The hopeful news for job seekers is that the central bank expects the unemployment rate will fall to 6% by the end of this year. That's getting awfully close to the Fed's goal for an unemployment rate in the mid 5% range. The big question on investors' minds is whether the Fed will raise interest rates by the end of 2014, but that doesn't look likely. All the Fed officials except one believe interest rates will remain near zero through the end of the year. The Fed is playing quite the limbo game at the moment -- if it raises interest rates too quickly, it will stunt economic growth. That's the last thing America needs after a ho-hum recovery. But if the Fed keeps rates low for too long, encouraging people to spend and take on debt, that could cause another bubble. Several states are still trying to recover from the housing bubble. 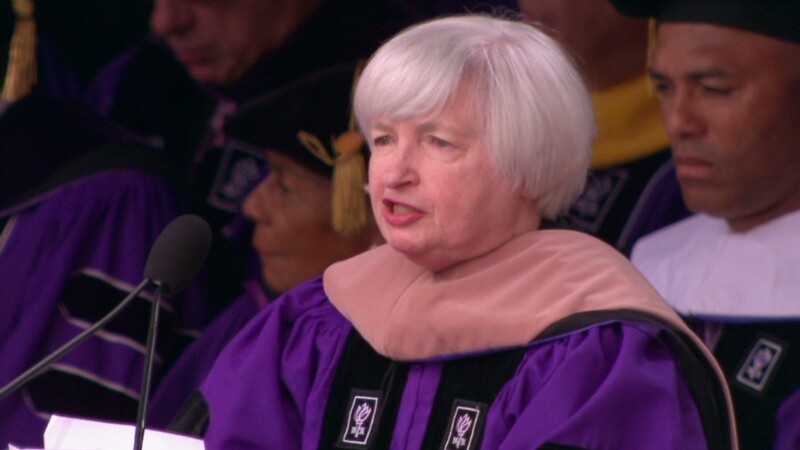 Federal Reserve chair Janet Yellen stressed repeatedly during a press conference Wednesday afternoon "there is no mechanical formula" for rate increases. The Fed will continue to look at a variety of factors, even beyond the health of the job market and inflation. So far, the monetary policy calisthenics are working. Stocks bounced following the statement and stayed up after the press conference. The Dow finished the day up nearly 100 points after being down much of the day, the S&P 500 hit a new record, and the Nasdaq closed at its highest point since March 2000. More on those forecasts: The Fed's new forecast for the unemployment rate is more upbeat than its previous prediction of 6.1 to 6.3%, and it comes after four months of solid job growth. Since February, the U.S. economy has added an average of 231,000 jobs each month, and the unemployment rate has fallen to 6.3% from 6.7%. "Economic activity has rebounded in recent months. Labor market indicators generally showed further improvement," the Fed said in a statement. But not all is rosy. Gross domestic product -- the broadest measure of economic activity -- was so weak in the first three months of 2014, that economists at the World Bank, International Monetary Fund and now the Fed, have been cutting their forecasts for overall growth this year. According to the Fed's forecasts, the U.S. economy is expected to grow only 2.1% to 2.3% this year, continuing the frustratingly slow recovery from the recession. The economy is expected to pick up momentum in the years ahead though, growing around 3% in 2015 and 2016. Stimulus curtailment continues: As was expected, the Fed also announced it will continue scaling back its monthly bond purchases. The central bank plans to buy $35 billion in bonds in July, down from the prior rate of $45 billion a month. The Fed has been engaged in two key policies since December 2008, in an effort to jumpstart a recovery from the deep recession. It has kept its key short-term interest rate, known as the federal funds rate, near zero, and it has been buying bonds to lower longer term interest rates as well. The Fed is expected to bring its bond-buying program to an end later this year, and start raising the federal funds rate sometime in 2015. 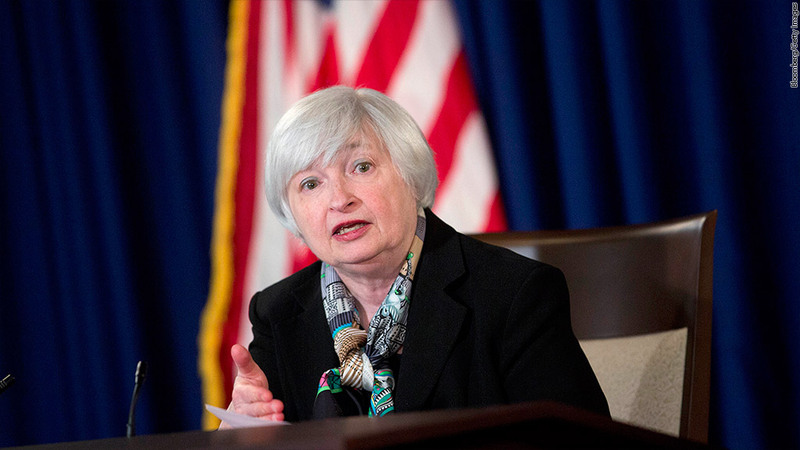 Janet Yellen said that the Fed will likely opt to keep interest rates low even after ending the bond-buying stimulus. Connecting the dots: Along with its economic forecasts, the Fed publishes a chart showing where each of its officials thinks the federal funds rate will sit in the future. 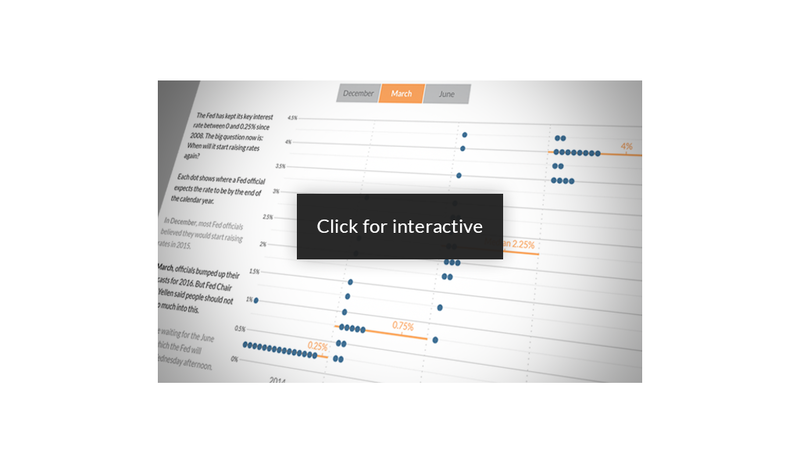 The new version released Wednesday shows the dots moving slightly higher in 2015 and 2016, meaning some Fed officials now expect rates to move higher at a faster rate than they previously predicted. According to the median forecast, Fed officials now expect the federal funds rate to be around 1.125% at the end of 2015. That said, Yellen previously told reporters not to focus so intently on this "dot plot," and she's expected to reiterate that warning this afternoon. Only 10 of the Fed's current 17 officials actually have a vote on its policies, and the chart doesn't represent the consensus view that voting members debate and agree upon in their meetings. "I would simply warn you that these dots are going to move up and down over time, a little bit this way or that," Yellen said at the last press conference in March. "I really don't think it's appropriate to read very much into it."